Comprehensive on-site service for enterprise level solutions. IT Asset Disposition is a simple concept: as your business computers and peripherals age, you need a sound plan to deal with equipment disposal. When computers, servers, printers, copiers, and peripherals of all kinds age out of usefulness, they present a variety of challenges. Without an IT Disposition plan in place, outdated collections of laptops, tablets, and many old electronics often make equipment inventories inaccurate. Old gear no longer in use takes up space, and without proper oversight can disappear from inventory, be cannibalized for parts, or end up in the trash. Old electronics often contain confidential information, ranging from customer data to passwords and logins for critical systems. Old electronics continue to represent a monetary value to your company. You may be required to follow corporate and regulatory compliance measures when it comes to disposing of old assets. Tossed-out IT represents an e-Waste hazard in landfills, where toxic metals and chemicals leach into the environment. At Protec Recycling, located in Birmingham, Alabama, we solve these problems for your business and more. Our expertise includes certified data destruction, experienced repurposing and remarketing of obsolete electronics, helping companies adhere to compliance measures, and a no-landfill guarantee. Would you like to learn more about IT Asset Disposition with Protec Recycling? Call us at 205-549-2120, or visit our Contact page today. When it comes to disposing of IT Assets, recycling is often the second-best choice. Protec works with a large network of resellers, brokers, and dealers. We can provide a return on investment for your company’s outdated technology. It doesn’t stop there. Protec can recycle, remarket, or repurpose a wide range of electronic elements, such as cables and wires, cell phones, tablets and mobile devices, audio-visual gear, battery backups, TVs, faxes, modems and routers, printers, copiers, toner, ink, and more. For commercial scale operations, Protec provides a comprehensive on-site service, providing you with documented IT disposition. 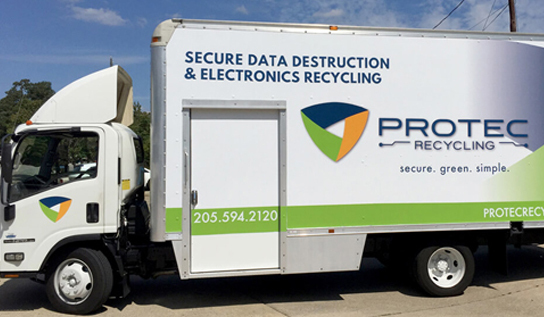 At Protec, our mission is to maximize the value of your aged-out IT assets and electronic equipment in a legally compliant, data secure, trackable, and environmentally safe manner.